Jason Kenney says there was nothing improper or even unusual about staff on his successful 2017 campaign to lead Alberta’s United Conservative Party helping out a rival, and he denies there was any plot to have Jeff Callaway run as a stalking-horse candidate on his behalf. Mr. Kenney and the UCP have been under attack since a trove of e-mails leaked over the weekend that showed staff from his leadership campaign provided speaking notes, message planning, graphics and videos to Mr. Callaway’s team while the pair were ostensibly competing to lead the newly created party. Mr. Callaway’s campaign co-manager is now co-operating with the election commissioner’s investigation and alleges Mr. Kenney’s campaign recruited Mr. Callaway to launch a leadership bid that was never intended to make it to the final ballot. The revelations came ahead of a spring election campaign that could begin at any time. Mr. Kenney held a news conference Monday to respond to the NDP government’s pre-election Throne Speech and position his own campaign, but instead spent an hour fielding questions about the UCP leadership race. He said no one on his campaign did anything wrong. 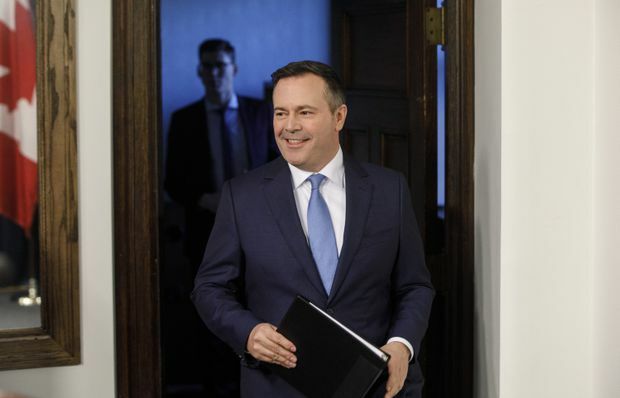 “The two campaigns communicated on issues management, communications and research and things like that in a way that I think is normal,” Mr. Kenney told reporters in Edmonton. Mr. Callaway has been accused of running a “kamikaze” campaign in which he would attack former Wildrose Party leader Brian Jean before pulling out of the race. Mr. Callaway eventually ended his campaign and endorsed Mr. Kenney, though he, too, has denied working to benefit Mr. Kenney. In the leaked e-mails, Mr. Kenney’s current deputy chief of staff, Matt Wolf, was in regular contact with Cameron Davies, who was the co-manager of Mr. Callaway’s campaign. In one exchange, Mr. Davies laid out a proposed timeline for Mr. Callaway to drop out. “I learned about Jeff’s decision to withdraw and endorse me the night before he made that announcement,” Mr. Kenney said. In addition, the province’s election commissioner and the RCMP are both looking into the source of Mr. Callaway’s donations, though Mr. Kenney has maintained that the investigation doesn’t have anything to do with him. One donor, Karen Brown, has been fined $3,500 for donating money that wasn’t hers, while Mr. Davies has been fined $15,000 for obstructing an investigation. Mr. Davies told Macleans that he received $60,000 from a corporation called Agropyron Enterprises Ltd. and that he assigned some of that money to some of Mr. Callaway’s donors. Agropyron is controlled by Robyn Lore, also a Callaway donor, who told Macleans it was a loan and he did not know what Mr. Davies did with the money. The governing New Democrats have seized on the leadership controversy and are expected to raise it frequently during the election campaign. Premier Rachel Notley said Mr. Kenney has repeatedly lied to Albertans about what happened and what he knew about it. “There is a very significant scandal right now. At its very best it amounts to very dark backroom politics focused on thwarting democracy, at its worst it is criminal in nature,” Ms. Notley told a news conference in Edmonton. On Monday, the government promised new measures to strengthen health care and the province’s democratic institutions in a Throne Speech that served as a preview of Ms. Notley’s planned campaign for re-election. One of the biggest promises in the speech is a major expansion of a pilot program brought in by Ms. Notley that created 7,300 child-care spaces that cost $25 per day. The Premier promised a “very detailed proposal” for an expanded program that would be open to all families across the province, but would not confirm whether any legislation would be passed. The first bill the government tabled after the Throne Speech prohibits an expansion of privatized health care and queue-jumping by patients, while creating new restrictions on billing by physicians and dentists paid through the public system. A proposal on democratic reform, which is currently not scheduled for introduction as a bill, would look to close what Ms. Notley called loopholes in the province’s political financing law. She said the presence of political action committees in the province has allowed “big money,” including unions and corporations, to have a voice in the political process and circumvent the financing law introduced by her government.